Tigertek Morphe RDA – ONLY $14.39!!! 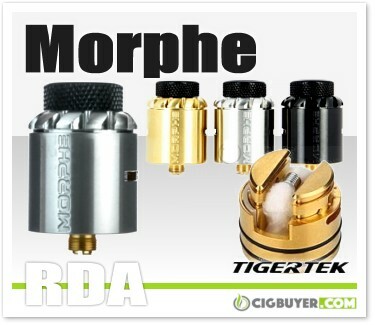 Check out what just hit the clearance shelves at US vendor Vapor DNA – the Tigertek Morphe RDA for only $14.39! They also have the Tigertek Springer S RTA for just $13.49; but let’s focus on the Morphe RDA because it has an innovative screwless, spring-post design that really sets it apart. No screwdriver is required, just press the spring-loaded 5mm by 1mm terminal to set your coil. Designed for single coil configurations, it features dual adjustable side airflow that feeds directly to the build chamber to provide outstanding flavor and impressive clouds. It houses a 6mm deep juice well and comes with a knurled 8mm bore 810 delrin drip tip, 6mm bore 510 delrin drip tip, 510 adapter, replacement springs and a squonk-ready 510 pin.